Have you ever wondered about recessional moraines? I guess not too many people have pondered such a deep question, but on my recent flight over the Sierra Nevada, I was excited to see what was without a doubt the best example I've ever seen of this feature. Recessional moraines are the piles of glacial till (loose debris) that form around the terminal margins of glaciers that are in the process of melting back over decades or centuries. Quickly receding glaciers might not leave such ridges, but if the climate briefly stabilizes, the moraines will form around the end of the glacier. Such moraines can be hard to see at times. 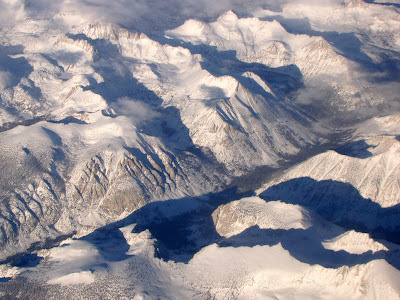 There are several prominent moraines in places like Yosemite Valley and Kings Canyon, but they are covered by forests and are thus difficult to see from above. When the reservoir holding back Lake Thomas A. Edison in the upper drainage of the San Joaquin River was constructed, the forest cover was removed. During the winter, the lake is mostly drained, and with the low sun angle on snow, the moraines stood out in sharp relief. The moraines were mapped by Joseph Birman in the 1950s as Tioga stage glaciers, dating back to around 20,000 to 13,000 years ago. 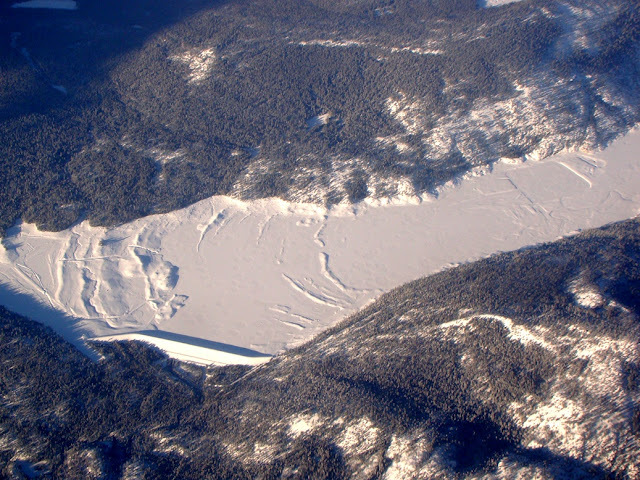 This was the last major glacial episode to affect the Sierra canyons, and was responsible for most of the lakes and glacial polish that can be found in the mountains today. Moments later we were flying along Mono Creek leading to the Sierra Crest, where I could see a multitude of classical glacial features. In one view I could see all the features I am always trying to sketch on the chalkboard in my classes illustrating the erosional features of alpine glaciation. I've labeled some of the most obvious features below. As uncomfortable and inconvenient as flying can be, I was having a pretty good time! According to this interesting article from the New York Times, it's larger than 9 American states. It is the largest patch of Class 1 Soil in the world (i.e., the best for agriculture). More than 230 kinds of crops and produce are grown there, and the output represents 8% of the nation's agricultural output (on 1% of the land). Around 6.8 million people live there, and the average per capita income is lower than most of the rest of the country (it has three of the five poorest cities), and unemployment is far higher. It is California's Great Valley, my home. The valley is 400 miles long, 30-50 miles wide, and is almost entirely flat (except for the Sutter Buttes, the highest elevations are 400 feet or less). 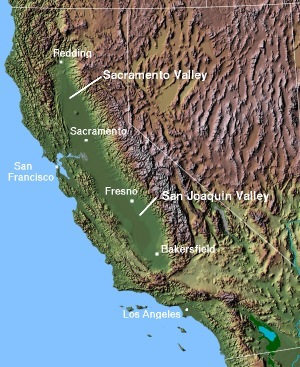 It is drained by several major rivers, including the Feather and Sacramento Rivers to the north, and the San Joaquin, Kings and Kern Rivers to the south. Although most of the rivers leave the valley through the Sacramento Delta into San Francisco Bay, those in the south do not. They once ended in huge lakes like Tulare and Buena Vista, but today the lakes are long gone, having been dried up by agricultural diversions upstream. I've long heard that only 5% of the valley remains in the natural state that existed prior to agricultural development, and from the air, this is obvious. All the times I've flown over it, I have been struck by the continuous patchwork of plowed fields (it clearly resembles the kinds of blankets my grandmother used to make out of the leftover fabric squares). There are a few tracts of undeveloped grasslands off to the south, but for the most part only the rivers retain much of their original vegetation, but only in a few places. Today's photos come from three distinctly different parts of the valley's river systems. 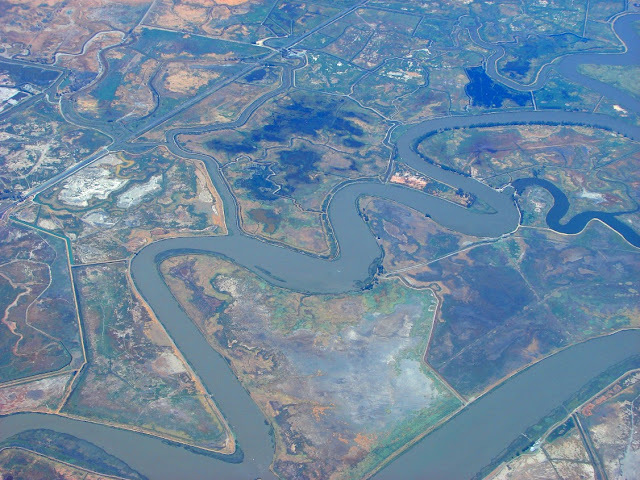 In the colorful top photo, we can see a portion of the Sacramento Delta, where the San Joaquin and Sacramento Rivers come together in a maze of islands that have been mostly converted to farmlands. The islands are protected (somewhat) from seasonal floods by a series of poorly constructed levees that are subject to destruction from even moderate earthquakes. This has set up what potentially could end up as California's worst possible natural disaster (at least in the monetary sense). The islands have been sinking due to groundwater withdrawal, soil loss, and oxidation of organic material in the soils. Most of them are now below sea level, with only the vulnerable levees keeping them from being flooded. Since the intake pumps for the California Water Project lie in the midst of these islands, broken levees will draw salt water into the delta, where the domestic water supply for most of the southern state is tapped. 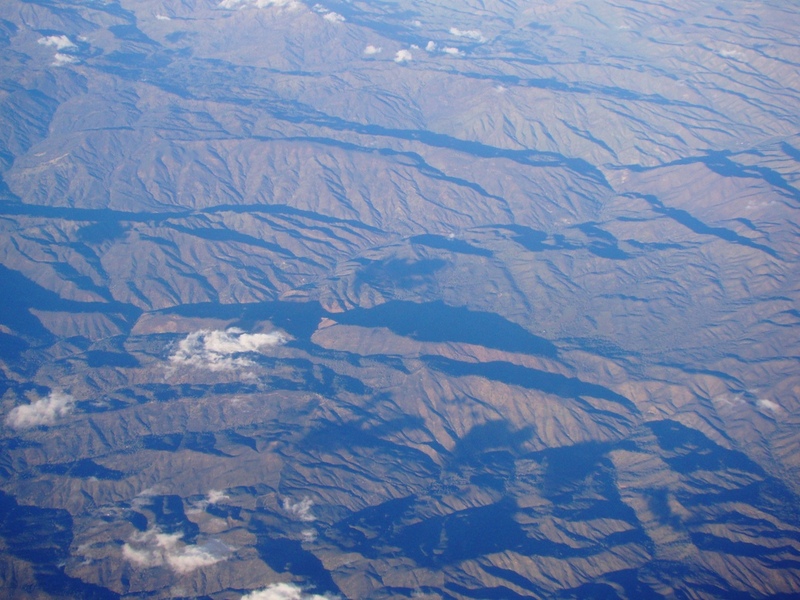 An earthquake has the capability to disrupt the state water system for several years. 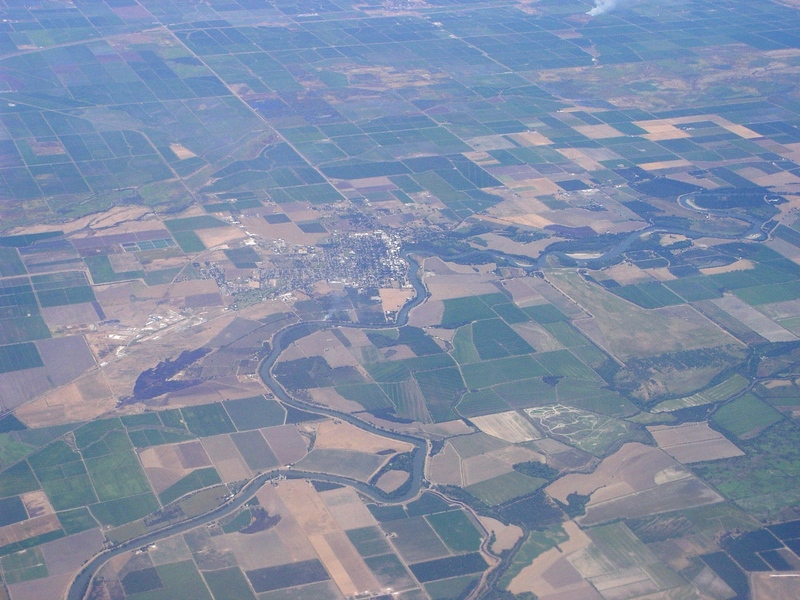 The north end of the Great Valley is drained by the Sacramento River which can be seen in the photo above, taken near Colusa. The landscape has been completely co-opted by agricultural fields, right up to river's edge. It looks like the river has been "conquered" and tamed by the works of humankind, but floods like those of 1997 and especially of 1861-62 could leave just about the entire area in the photo above under 10-20 feet of water (see my take on these ARkstorms here). The San Joaquin River drainage contains some of last remaining natural grasslands and riparian landscapes in the Great Valley. 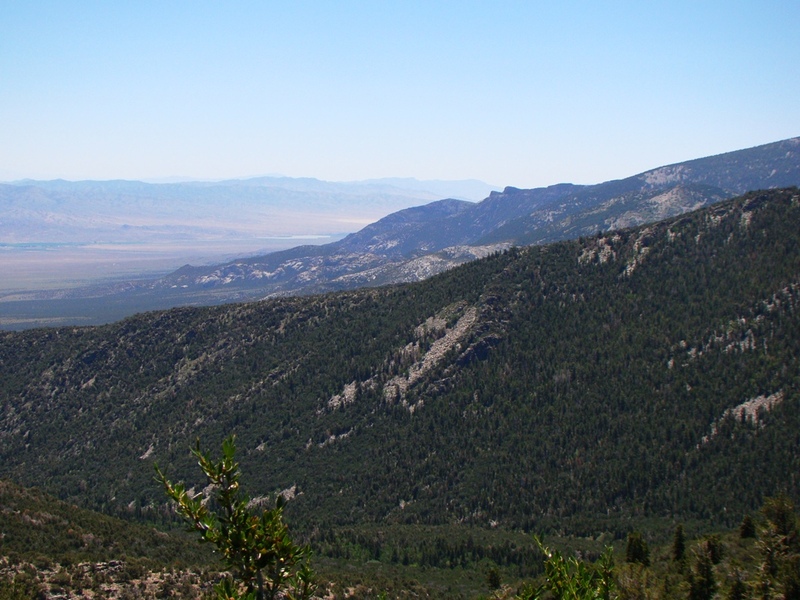 The structure of the valley is that of a series of shallow basins separated by the alluvial fan systems formed by the Merced and San Joaquin Rivers. The basins have essentially caused the river to back up and develop wide floodplains where the streams meandered widely, changing channels in unpredictable ways. 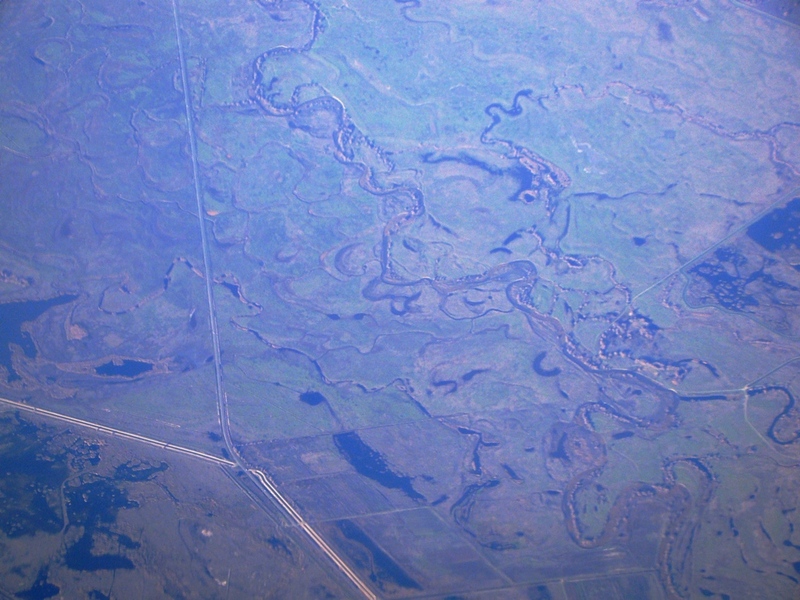 The area in the picture above is just north of the town of Los Banos, an area of abandoned meanders, bogs and swamps protected as the San Luis National Wildlife Refuge and Great Valley Grasslands State Park. The land is not entirely unaffected...decreased flows caused by reservoirs and diversions upstream have caused many of the swampy areas to dry up. Efforts (and negotiations) are ongoing to increase river flows in a hope of rebuilding the disrupted ecosystems, especially those of the salmon which used to be common in these waters. My grandfather had wrinkles. Lots of them. He was a man who spent a large part of his life working outdoors in the days before sunscreen lotions. You could see in his face the rigors of the Great Depression and the tough choices that came with trying to farm in Oklahoma and Texas in the Dust Bowl years. In the same way, the Earth tells a story through the pattern of wrinkles on the surface of the planet. 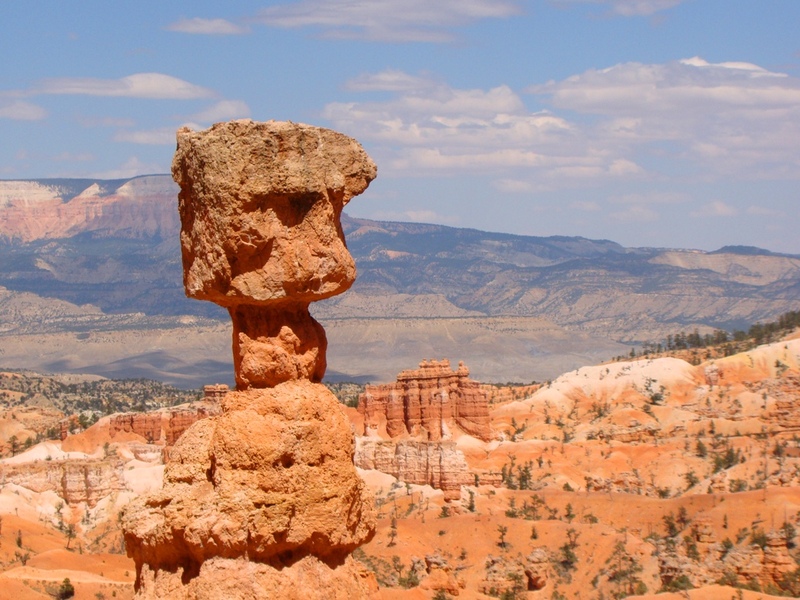 Some rocks are softer, others are harder, and some are in horizontal layers while others are tilted. Some aren't in layers at all, such as plutonic intrusive rocks, so the type of rock exposed is fairly uniform, unless it has been broken up by jointing. Water and other agents of erosion attack the rocks in a differential manner, and reveal something of the underlying structure in the way that streams cross the landscape (the most commonly recognized drainage patterns are shown in the diagram below). In the case of my last airline trip, it was a quick way of determining what part of California's Coast Ranges I was flying over. 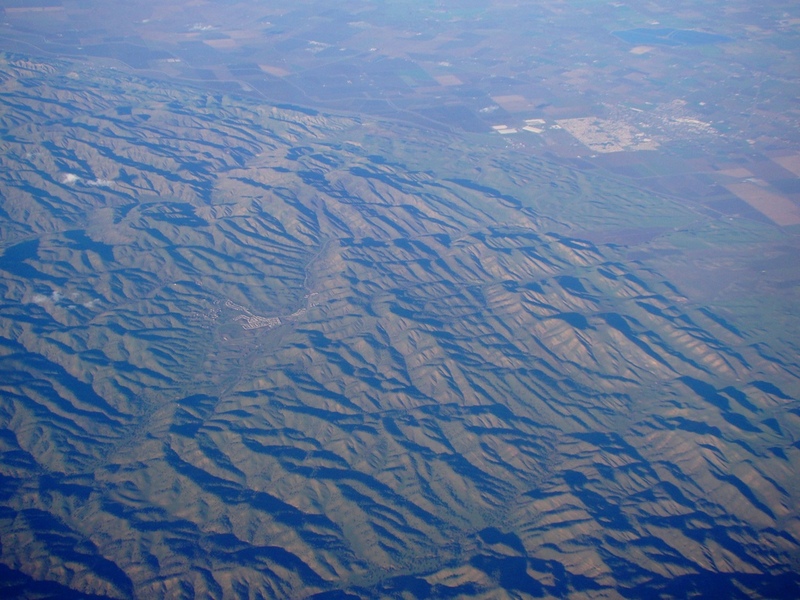 The Coast Ranges are about as schizophrenic as can be: crossed by the iconic San Andreas fault and dozens of others, numerous tracts of rock are juxtaposed against each other. 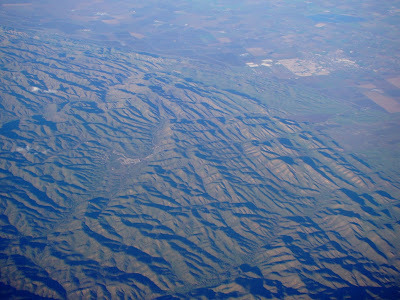 These rock groupings, called terranes, include rocks related to the Sierra Nevada batholith (the Salinian Block), the Franciscan Complex (rocks formed within a trench-subduction zone during Mesozoic time), the Great Valley Group (rocks that formed in a forearc basin between the trench and the Sierra Nevada volcanic arc), and the Coast Ranges Ophiolite (rocks derived from the oceanic crust of the Pacific/Farallon plates and the underlying mantle). 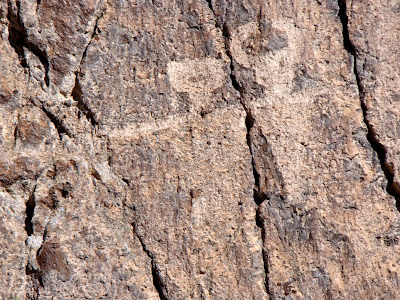 The first photo above doesn't reveal a lot of rock, as most of the surfaces are covered by grass and brush. If you concentrate on any one drainage, you will notice that many small tributary channels gather into larger and larger channels in the way that a tree has multitudes of branches that end up at a single trunk. This is an example of dendritic ("tree-like") drainage pattern, which indicates that the underlying rock is fairly uniform. There is no evidence of sedimentary layering, and thus the rocks must be part of the Salinian Block, the Coast Range Ophiolite, or the Franciscan Complex (layers are found over short distances in the latter two, but not enough to effect the overall drainage pattern). Of course, this part of the Coast Ranges is right in my backyard, so I knew I was seeing mainly the ophiolite found in the upper part of Del Puerto Canyon above the town of Patterson. On the other hand, look at the picture above, from the easternmost part of the Coast Ranges (the town of Patterson is the light colored area in the upper right hand side). The shadows on the right half of the picture run parallel to each other, but at right angles to the eastern margin of the mountain range. Streams that would be expected to run from left to right down the slope of the mountains are deflected into northwest trending strips. Clearly some of the rock here is more resistant to erosion, and the pattern suggests sedimentary layers that have been turned on edge. This is the hallmark of the Great Valley Group. These rocks were laid down in a shallow sea that subsided and collected more sediments and subsided under the weight of the overlying sediments again, over and over. 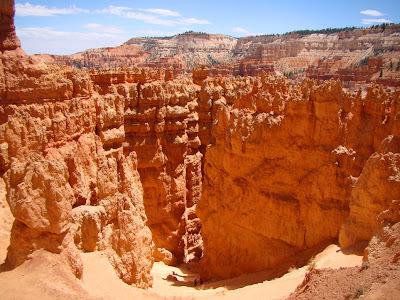 Eventually the sediments reached a thickness of 20,000-25,000 feet. Later deformation turned this incredibly thick sequence on end forming a vast homocline, indicated by the trellis drainage pattern. I saw one other really distinctive drainage pattern on my trip, but far removed from these first two photos. If you look at the photo below, you might pick out that many of the smaller channels are dendritic, but that the larger channels are roughly parallel to each other. This is called a parallel drainage pattern, caused by streams eroding uniform, but slightly sloping rocks. I was lost at the moment because we had been flying over clouds for several hours, but the moment I saw these channels, I knew exactly where we were: on the flanks of the Valles Caldera (sometimes called the Jemez Caldera). There is no other place in New Mexico (and indeed most of the southwest) quite like it. The caldera is a vast volcanic feature which formed when a gigantic eruption about 1.15 million years ago coated the entire region with around 70 cubic miles of volcanic ash. The volume of volcanic ash blown out of the volcanic vent was so great that the center of the volcano collapsed inwards, forming the caldera. Popular media outlets call these calderas "supervolcanoes" (Yellowstone being the most famous example). The NASA image below gives a wider perspective of the volcano. The circular mounds in the central area are volcanic cones that erupted years later. From this perspective (and distance), the drainage could be considered more of a radial pattern. The Airliner Chronicles is one of my on-again/off-again serial features, which is usually updated whenever I fly somewhere. These pics were from a flight to and from St. Louis during the Christmas break. Moon and Jupiter in Conjunction: Last chance until 2026! 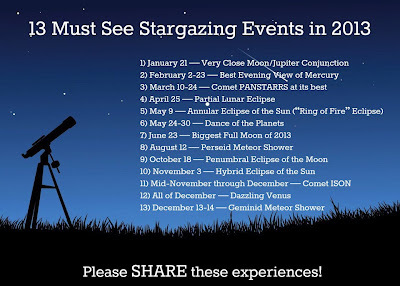 Courtesy of "Science is Awesome" over at Facebook, here is a list of some of the most impressive astronomical events of 2013, including the hopefully spectacular show of Comet ISON in November and December. I remember Hale-Bopp from the 1990s and this is possibly going to be more impressive. 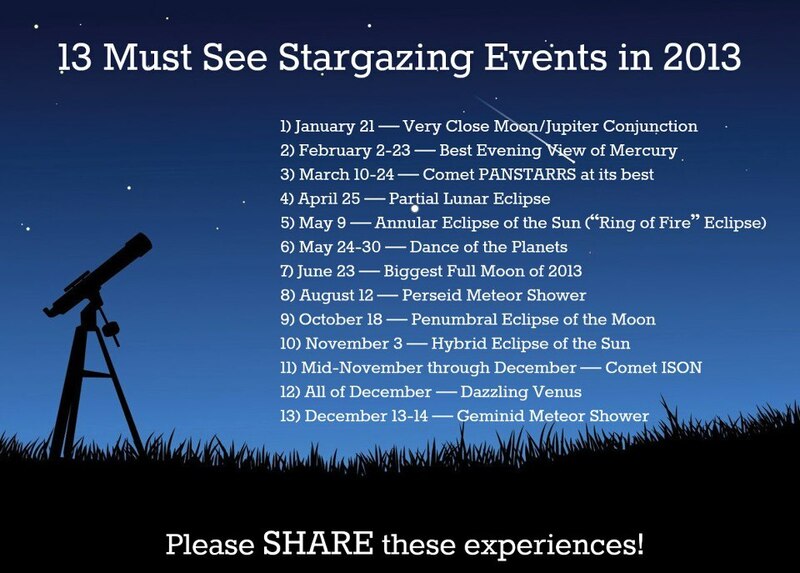 If you check the list closely, you'll see that the first event is happening right now, as Jupiter and the Moon appear to be very close in the sky (if you are in South America, Jupiter will disappear behind the Moon). I took the photo above just a few moments ago. PS: I realized the headline might be less than clear. It means that the Moon and Jupiter will not be this close in the sky again until 2026. Conjunctions do happen more often than this. 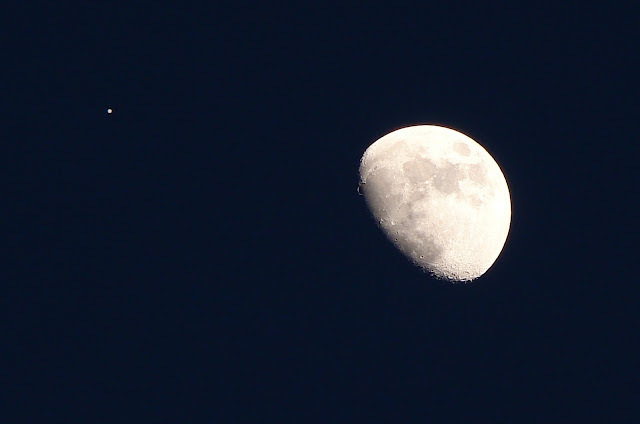 More on the conjunction of the Moon and Jupiter can be found by clicking here. We'd been on the road for a while, back in June of 2012. 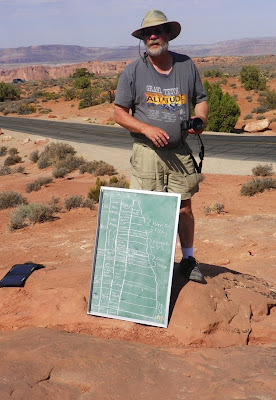 Our tour of the Abandoned Lands had taken us on a grand loop that included Grand Canyon, Petrified Forest, the pueblos of New Mexico, the Jemez Caldera, Chaco Canyon, Mesa Verde, Arches, Canyonlands, and Bryce Canyon National Park. 35 of us had been living as a slightly dysfunctional family for the last 15 days, with all the excitement and frustration that such expeditions entail. We were now leaving the Colorado Plateau and making a three day journey home through a part of the country that has been, if anything, even more abandoned than the Plateau: the Basin and Range Province. 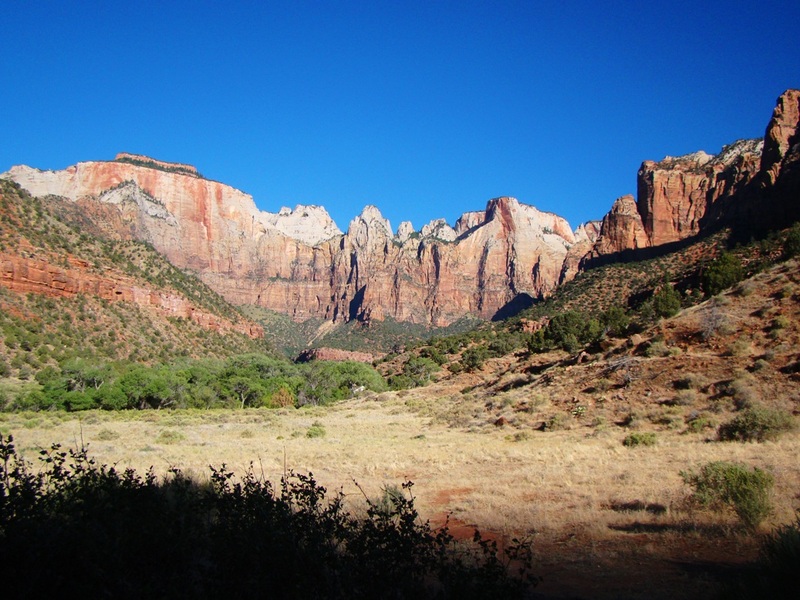 After our day of exploring Bryce Canyon, we moved down the highway to Zion National Park for our last evening in Utah. In the morning, we learned about some of the spectacular geology of the wonderful park, and our students were given several hours of free time to hike in the upper canyon. I'd like to show you an entire album of beautiful pictures of one of our most beautiful national parks, but to tell the unvarnished truth...I was tired and worn out! I had explored Zion four weeks earlier, and on this particular morning, I really wanted a...normal breakfast. Mrs. Geotripper and I went down to Springdale, and while the others were struggling up Angel's Landing, or slogging up the river in the Virgin Narrows, we sat sipping mocha and luxuriating our way through a couple of delicious breaksfast burritos at the Cafe Soleil. We were also doing something that had been well nigh impossible for most of the last two weeks: we went online. I even managed a short post that day. 2012 had been a horrific drought year, and for much of our trip, brushfires had been a companion, either in plain sight on the distant hills, or far beyond the horizon. On this day, the fires were a lot closer. 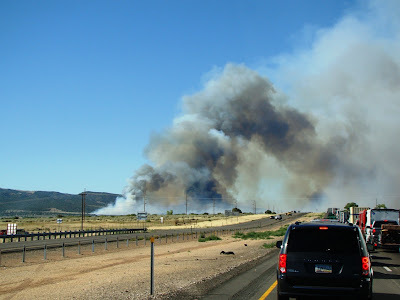 It was burning next to I-15 between St. George and Cedar City. And it brought traffic to a dead standstill in the 105 degree heat. Ultimately one of our vans stalled (the food van! ), and one of our party ended up in the emergency room with smoke inhalation problems. We were three hours away from our destination and the sun was setting. 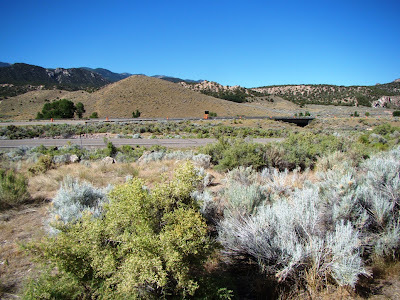 Ultimately, we left the van and several of our party in Cedar City for the night, and the rest of us headed to Great Basin National Park, arriving at our campsite around midnight. A new sunrise is a wonderful thing, bringing as it does the promise of a different day. 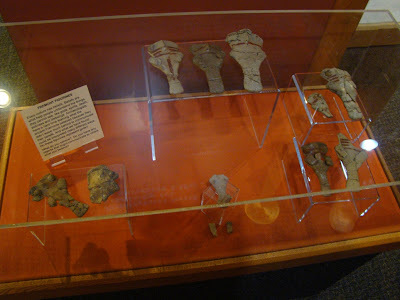 We were in Great Basin National Park, a park with no basin, but with lots of other neat things. The park was established in 1986 to preserve a representative part of the Basin and Range province. 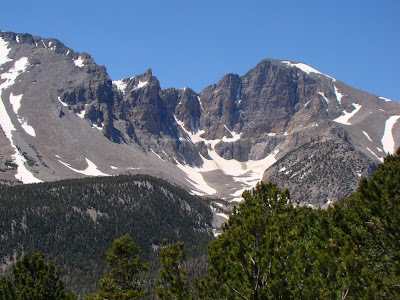 It includes Nevada's highest entire mountain (sure, Boundary Peak is a bit higher, but it's mostly in California), a forest that included the oldest living thing on the planet (a bristlecone pine), Nevada's only glacier, and a marvelous limestone cavern: Lehman Cave. 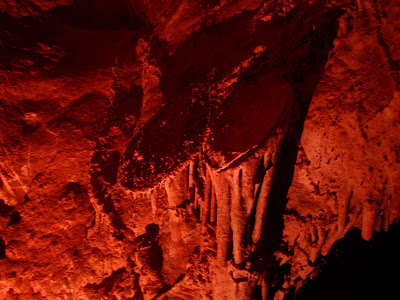 We took the tour of the cavern, which is in good shape for a cave that has been known and explored for more than a century. Some areas were damaged by the early visitors, but most rooms are decorated with a fine variety of speleothems (an overall term for stalactites, stalagmites, columns and all the other features found in caverns). 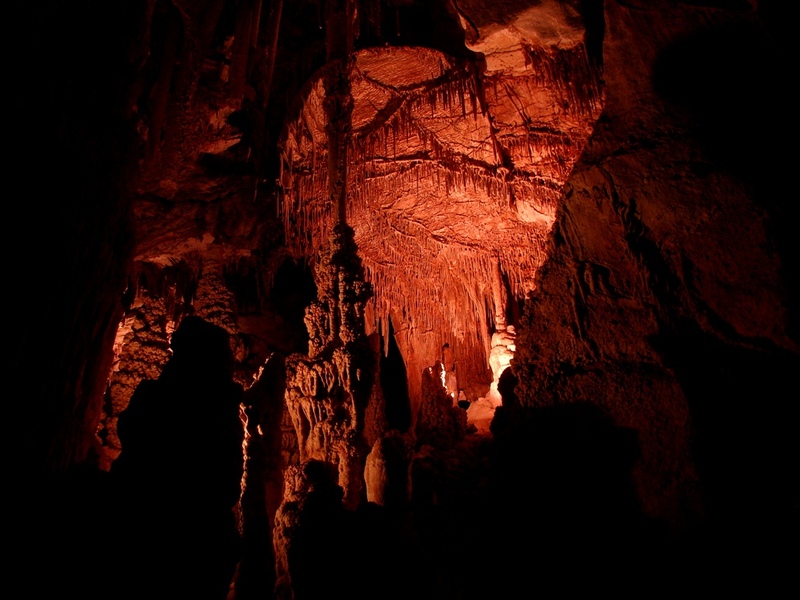 Those who vandalize caverns usually concentrate on stalactites and soda straws, the speleothems which hang from the ceiling of the cave. 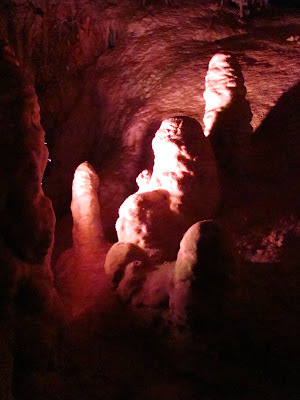 Stalagmites, which grow from the floor upwards are sometimes passed over in the less visited caves by souvenir hunters. There are some fine ones in the depths of Lehman (below). Columns are harder to break apart, and don't look as "cool" in a cave vandal's collection. Some fantastic columns remain in pristine condition at Lehman Cave. 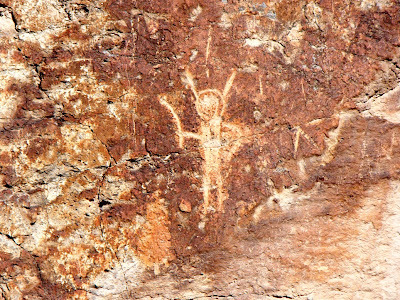 Don't get me wrong...people who vandalize and steal from caves are criminals, plain and simple. 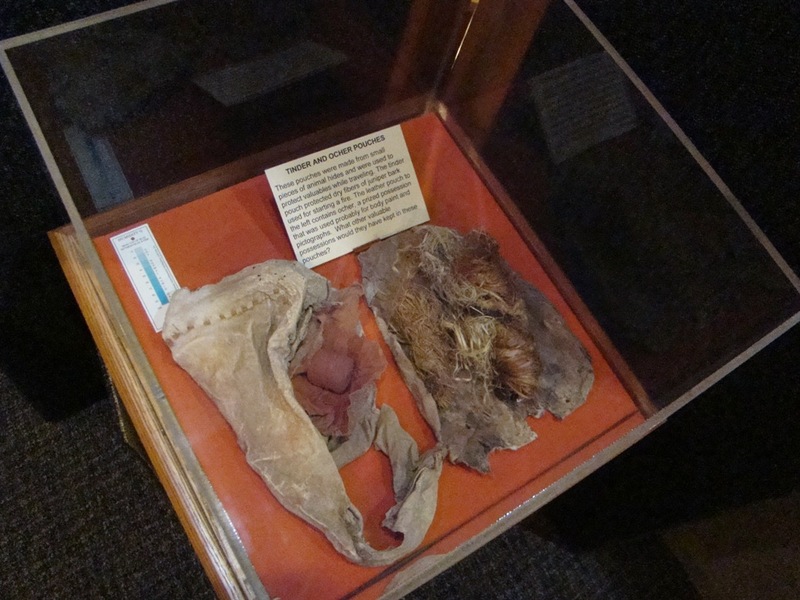 It's just that in the earlier days, tourists were encouraged to collect a souvenir of their trip. 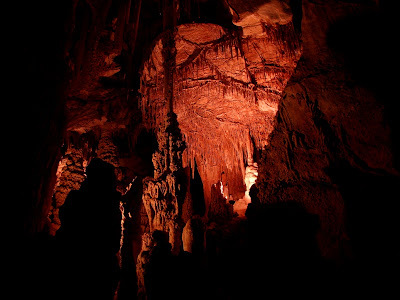 There were so many stalactites in newly discovered caves that it hardly seemed to hurt anything to break off a few. Until they were gone, that is, and a great many holes exist today that were once beautiful caverns in the past. 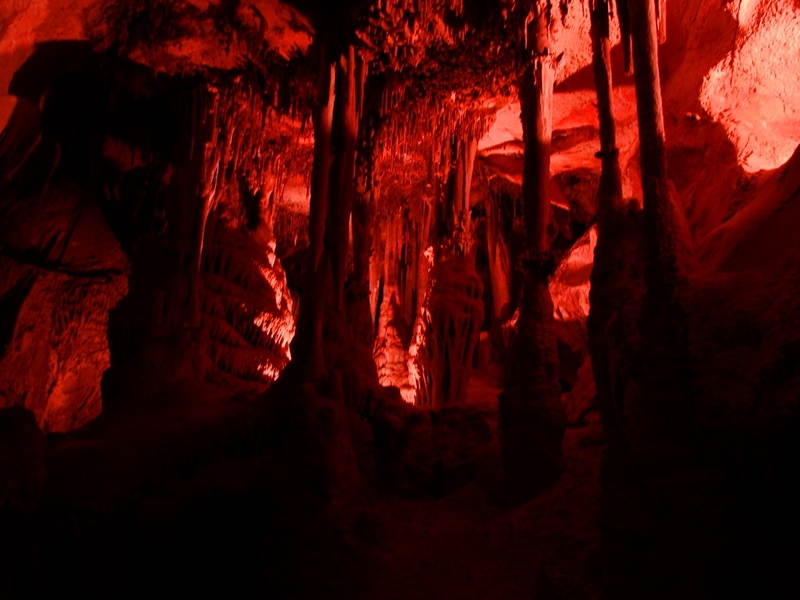 Lehman Cave is especially noted for the number (300+) of shields. The origin of these disc-shaped speleothems is somewhat enigmatic, and they are not present in most caves. Shields actually usually include two shields with a flat open surface between them (kind of like cymbals). After our tour, we set out across the Great Basin, on America's so-called "Loneliest Highway". 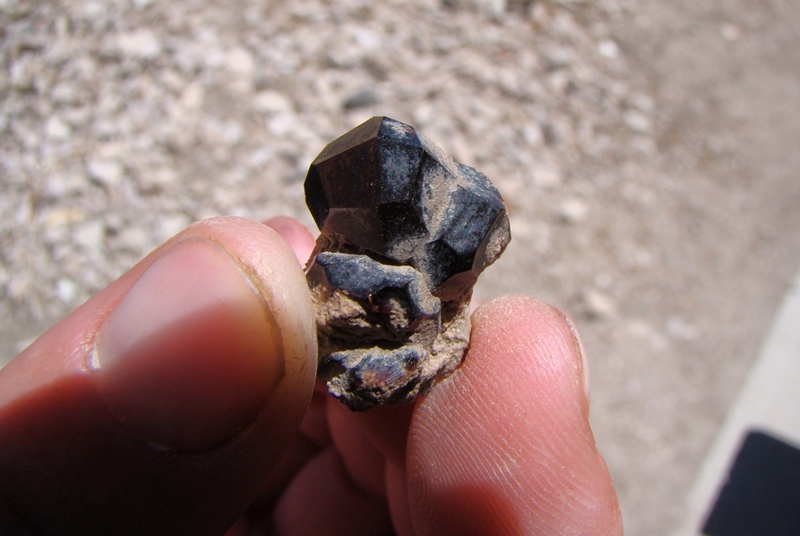 We detoured briefly to look for garnets at the imaginatively named Garnet Hill near Ely, Nevada. We spent a night at Berlin-Ichthyosaur State Park outside of Gabbs, Nevada, and the next day we were home, via Mono Lake and Tioga Pass in Yosemite National Park (see here for a description of the sights along that highway; we passed this way in 2011 and I wrote all about it). I hope you've enjoyed this blog series! I'll be trying to get all the posts compiled in one place if you are at all interested in catching the flow of the journey. I work in a school. I tell people about the world, what it is made of, and how it works. I help them understand how rocks are made, how the rocks are changed by water and air to become different rocks. I tell them that some rocks are very hot and come from deep inside the world and hurt people. I tell people about faults, the breaks in the rocks in the world that can move and make houses fall and hurt people. I tell how water and ice can change the way the world looks. I tell people how we get things from the rocks that allow us to make things like cars and houses. I tell people about animals and other living things from a long time ago, and can not be seen any more. Some of the animals were very big and would scare people, but most were smaller. I try to tell people how they can make the world a better place to live. You can see a great many other efforts at the site Ten Hundred Words of Science. I don't know if I submitted mine correctly (being a professor doesn't mean I can find the right links to click on when submitting...), but I was very impressed to read how so many others describe their work. How would your career or research look when described in the commonest 1,000 words? Here's the word editor to give it a shot: http://splasho.com/upgoer5/ . No wonder he abandoned the place...the best that Ebenezer Bryce could say about the national park that now bears his name was "It's a hell of a place to lose a cow". 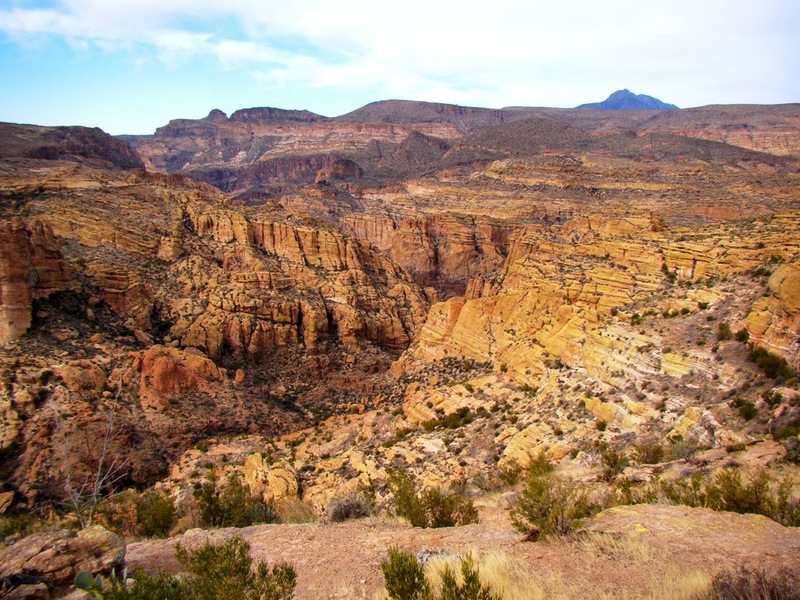 Ebenezer had a ranch for a few years in the 1870s in a canyon below the rim, but the region doesn't seem like much of a place to try and graze cattle. 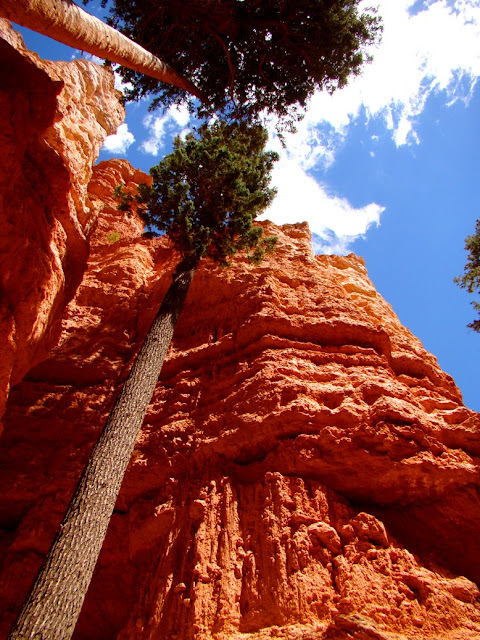 On the other hand, Bryce Canyon is one of the most unique landscapes on the planet, and was a wonderful stop during the latter part of our exploration of the Colorado Plateau. I've been calling this series "The Abandoned Lands" because the Colorado Plateau and adjacent provinces remain today one of the least populated parts of our nation, despite many efforts to settle the landscape over the centuries. The land always seems to defeat the efforts of human beings, but for geologists it is a treasure. 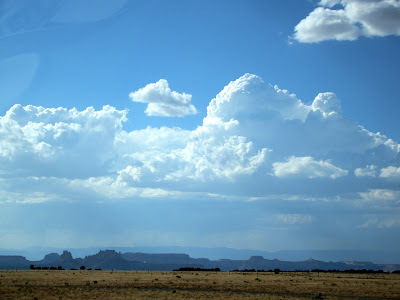 We had left Fremont Indian State Park and were headed south to Bryce Canyon National Park. Bryce is not really a canyon at all, but a series of horseshoe-shaped amphitheaters at the headwaters of the Paria "River", a tributary of the Colorado River system that flows south from the park (unless there is a flash flood in progress, the "river" designation is a clear exaggeration). The Sevier River drains the top of the plateau, which slopes towards the north. 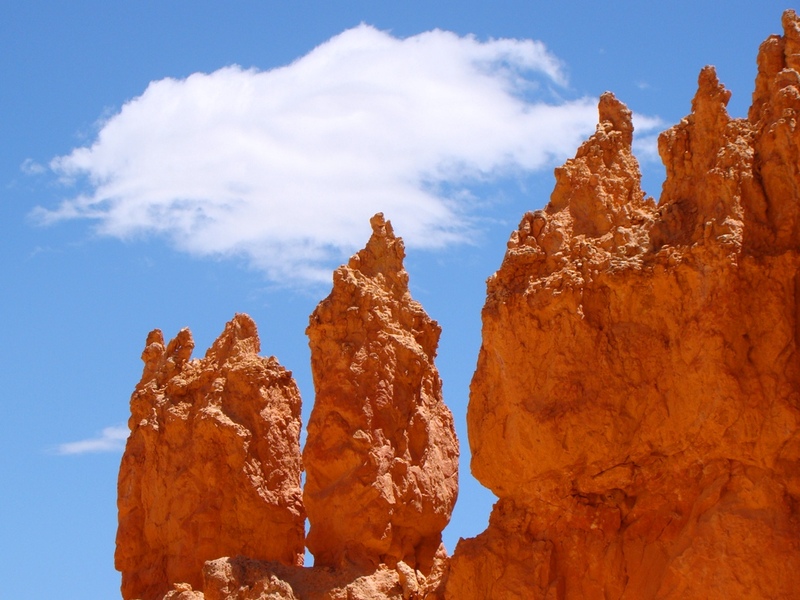 The pillars and spires are called hoodoos. The main rock type forming the cliffs of Bryce Canyon is the freshwater limestone deposit called the Claron Formation. 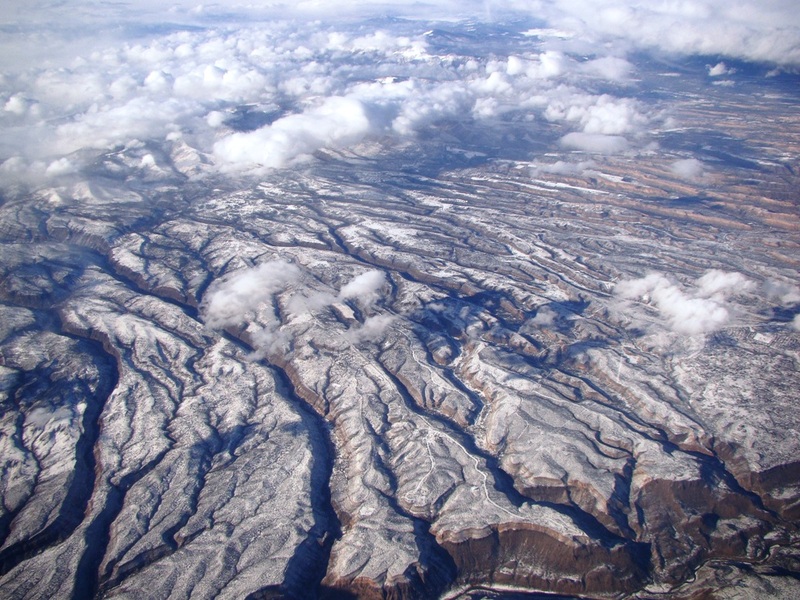 It accumulated in vast lakes that formed in the Colorado Plateau region in the aftermath of the Laramide Orogeny, a crustal disturbance that raised domes and mountain ranges across the American west around 50-70 million years ago. Intense weathering of the iron-bearing minerals in the sediment has produced the bright orange oxide coloring of the rock. 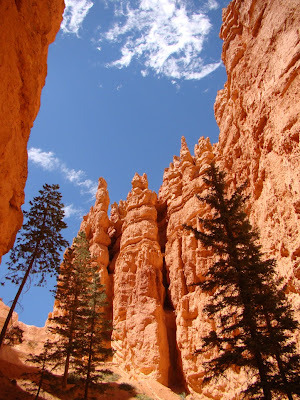 It had been a couple of years since I had been down the Navajo Loop trail through Wall Street Canyon, so that's where I headed when I gave the class a few hours of free time. The trail is not overly long at 1.3 miles, but it drops 550 feet, and every step down has to be repeated upwards on the other end of the loop. 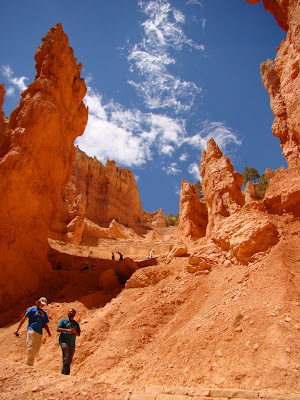 The Navajo Loop Trail is on my short list of greatest hikes in this country. There simply is no place quite like the deep cleft where the rocks seem to glow from within. 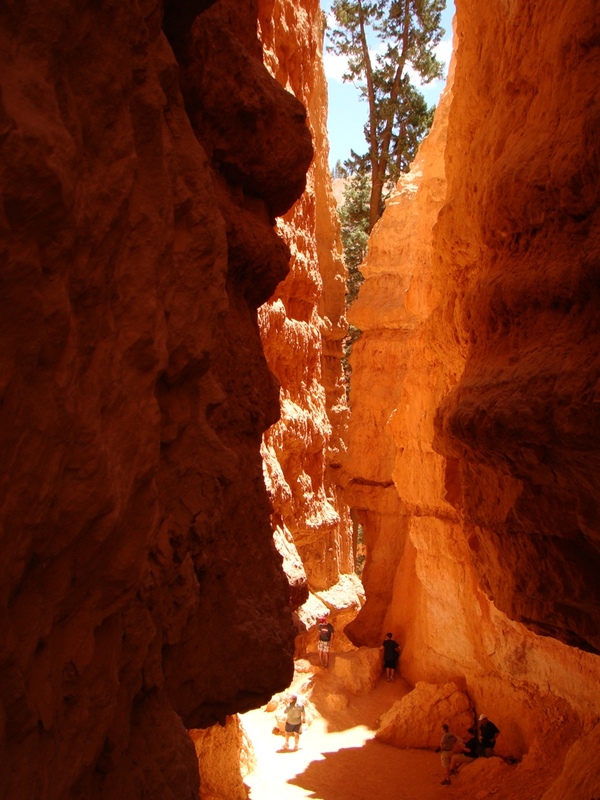 The switchbacks become shorter and shorter as one approaches the slot canyon. Erosion is stunningly rapid here, around 2-4 feet per century. I've been at Bryce during intense thunderstorms, and I find these numbers reasonable. Few plants ever gain a roothold on the upper trail, and certainly not trees. 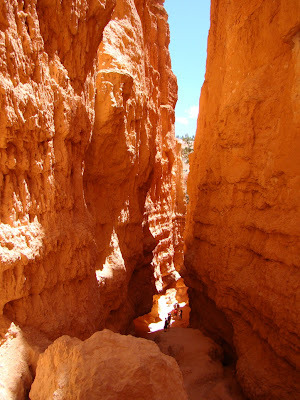 No trail can be perfectly safe, and the vertical walls and narrow slot canyons channel rockfalls right onto the trail. A serious rock fall happened in 2006, the remains of which have to be surmounted by hikers. Walking through the bottom of Wall Street Canyon, the trail levels some, and a few conifers have managed to sprout and grow upwards towards the life giving light. The trees, with their long branchless trunks are among the most photogenic I have ever seen. And then begins the climb back out! 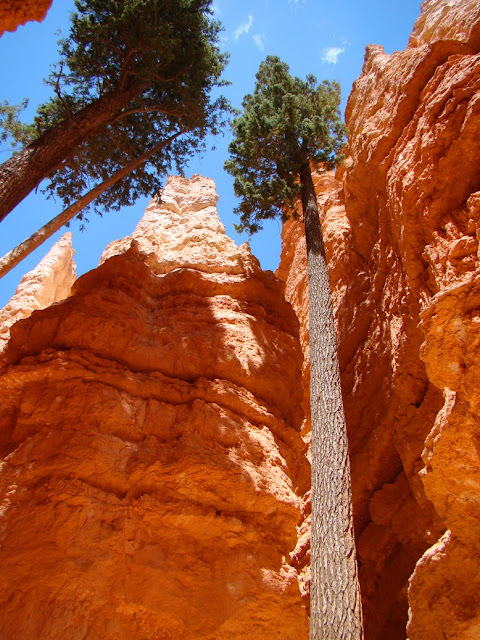 It's one thing to look down on distant hoodoos from a comfortable perch on the canyon rim, but the scale is totally different when you stand at their base looking up, knowing that you have to climb as far as they reach into the sky, and then some. As we approach the rim, more and more of the countryside becomes visible. 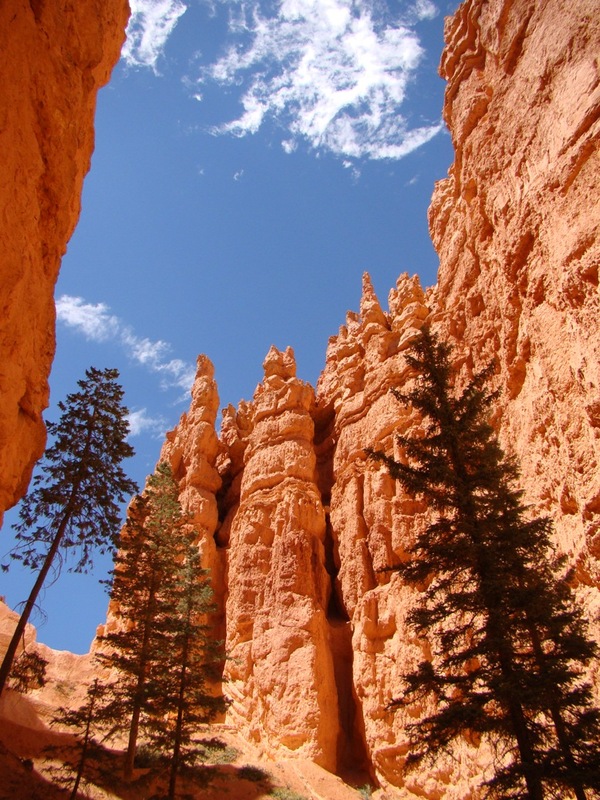 Arches in the hoodoos help to frame the distant cliffs of the Aquarius Plateau, composed of the same pink cliffs as Bryce, but several thousand feet higher on the other side of the Paunsaugunt fault. Close to the end of the trail we passed a hoodoo that recalled the monuments of Easter Island. The mind gives us all kinds of logic and order where such order doesn't really exist. 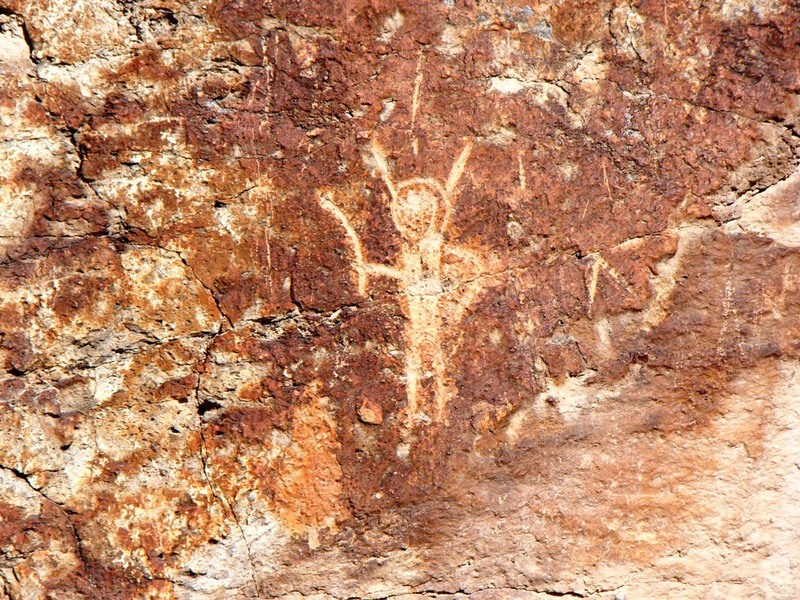 The Ancestral Pueblo culture gets a lot of attention in archaeological circles. They left behind tens of thousands of sites throughout the Colorado Plateau, and their ancestors still live on in the Hopi villages and the pueblos of New Mexico that we visited earlier in our journey through the Abandoned Lands. There was a much more cryptic culture that we encountered towards the end of our journey. We had left Arches National Park on the day after a spectacular exploration of the Canyonlands region and had pretty much a boring day. Really? A boring day on the Colorado Plateau? Well, sure they happen sometimes. We looked for fossils in some Paleozoic limestone exposures, and that was okay. But then it was five hours of showers, laundry, and grocery shopping in Moab. Then a failed attempt in the blazing hot sun of Green River trying to find some other fossils. Then a flat tire in the blazing sun. And then a long drive with no cool stops because we had fallen way behind schedule. 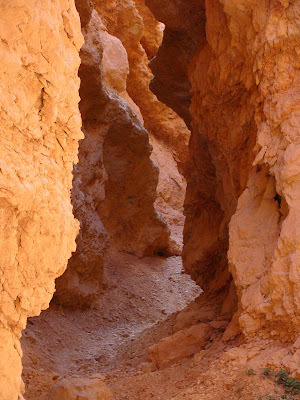 And darn it if there weren't some great things hidden in those distant canyons. The next day was different. We spent the night at Castle Rock Campground in Fremont Indian State Park and had a chance to see one of the more important archaeological sites in Utah. Not because it was an awe-inspiring architectural wonder, but because it was the former home of the enigmatic Fremont People, one that may have told us more about these people than any site found up to this point in time. And it was destroyed to make room for a freeway. Interstate 70 crosses the Wasatch Range in a narrow canyon. This wasn't a problem when the highway had only two lanes, but when the road was widened in the 1980s a great deal of excavating was necessary. When the machinery started cutting through Five Finger Ridge, the remains of a large Fremont Village was discovered. There was no stopping "progress"; the village site had to be destroyed. 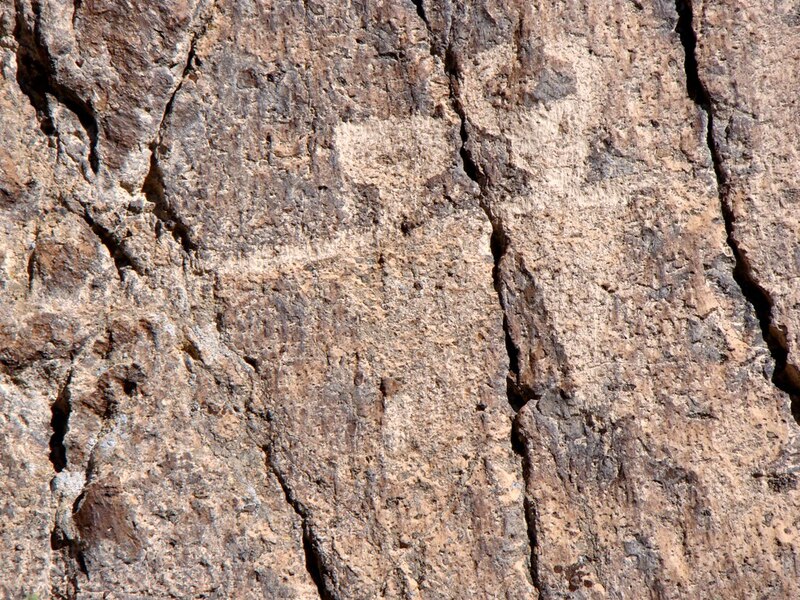 At least the state recognized the value of the village artifacts and their close proximity to an extensive exposure of interesting and sometimes bizarre petroglyphs. ...and clear evidence of space aliens! With this post I've returned to a blog series that I really need to finish! 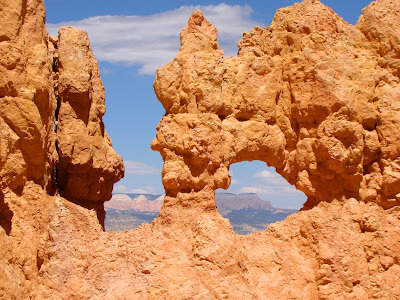 There are just a few more days to the journey, as we make our way south to Bryce Canyon and the Basin and Range Province. 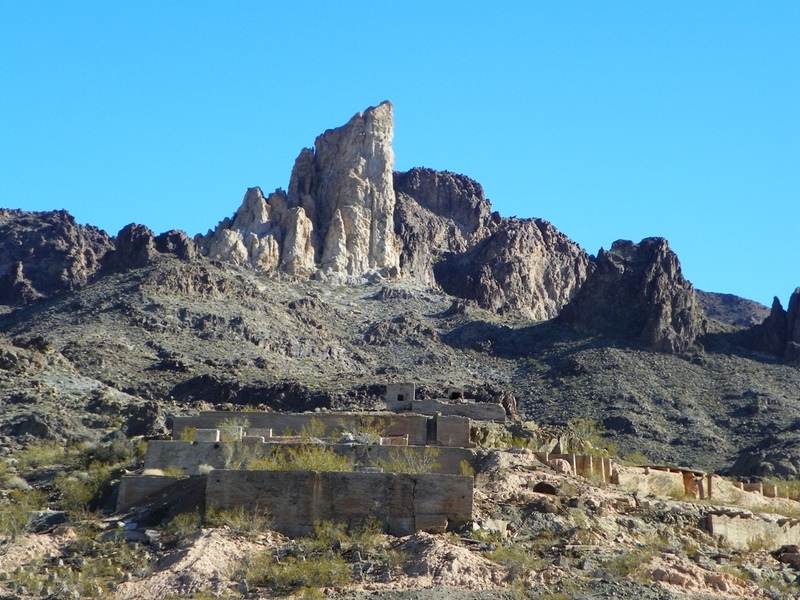 I've been to Phoenix quite a few times over the years, but somehow until last week had never taken Highway 88 to one of the most familiar sights in Arizona, the Superstition Mountains, home of the fabled Lost (not actually lost) Dutchman (not actually Dutch) Mine. It's probably fair to say that I wasn't trying very hard to find the legendary gold mine. I was having too much fun drinking in the stunning scenery and enjoying the fact that I was standing under a massive caldera ("supervolcano" in popular culture). 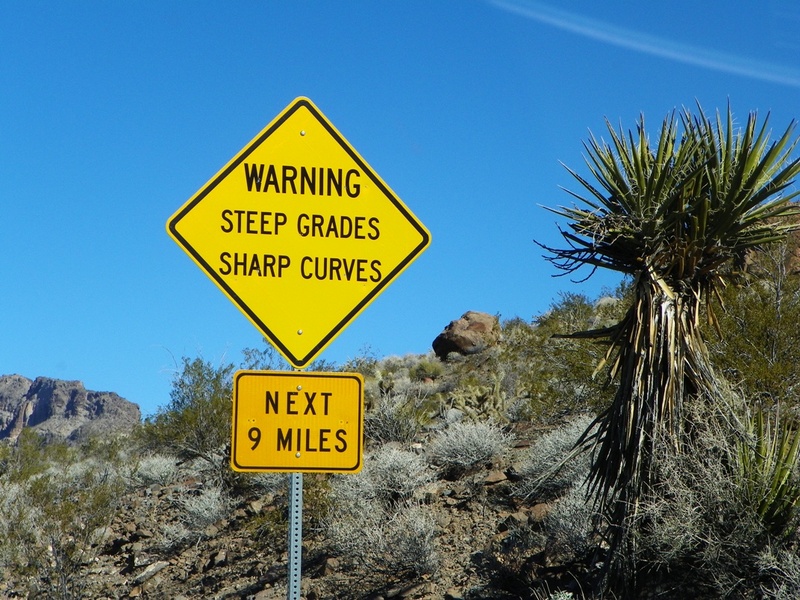 The Superstitions are...abrupt. 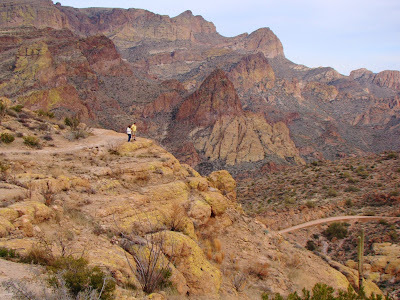 The sheer cliffs are fascinating; they are composed of volcanic rocks that once made up the core of a vast caldera complex not unlike Yellowstone. Several massive explosions rocked the region, and so much ash was blasted out of the magma chamber that the chamber collapsed in on itself, forming a series of vast 'craters' 10-12 miles across. The calderas of the Superstitions are 15-25 million years older than Yellowstone, are extinct, and have been deeply eroded. The high peaks and spires were once part of the resurgent dome of the caldera. As we drove east we reached the marginal area of the caldera, where vast blocks of tilted ash and tuff are exposed in deep rugged canyons. Highway 88, the Apache Trail, winds upwards from the Phoenix suburbs to a series of three reservoirs that were constructed a century ago to provide dependable water supplies for the vast city (it wasn't enough, though). 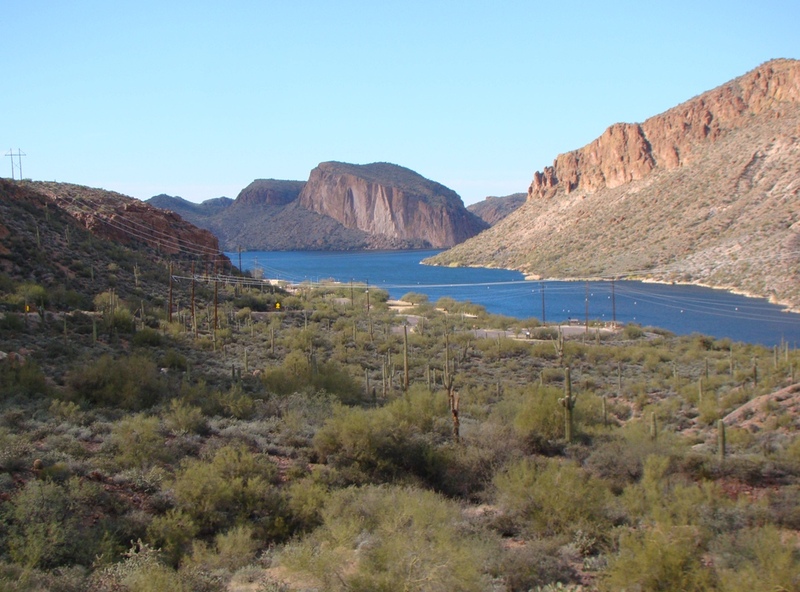 The reservoir below is Canyon Lake, the lowest of the three. Thick rhyolite flows form the bold cliffs. By the time we reached Fish Creek Canyon, the landscape had attained an other-worldly appearance. It seems just like the kind of place that one could hide...a secret gold mine! 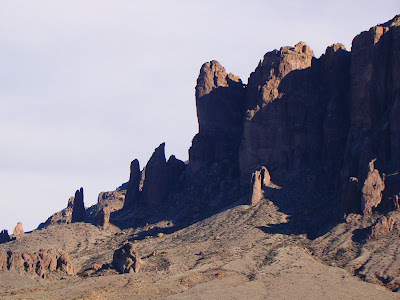 The Lost Dutchman Mine is the stuff of legend, as in it is probably more legend than fact. The Dutchman wasn't lost for one, and he wasn't a Dutchman, he was German. And as far as lost mines...the old miners left little to chance. There isn't much mineralization in the rhyolite tuff exposures, and since a few gold mines were developed around the margins of the old caldera, I'm willing to bet that the Jacob Waltz's mine was found long ago. But that's taking all the fun out of it, I guess. Gold just doesn't grab me the way the imagination does...I stood among these rocks reliving the vast explosions that rocked this place, protected by the safe distance of time. Imagine an explosion so big that it incinerates all life for miles in all directions, a blast 500 times larger than the eruption at Mt. St. Helens in 1980. Imagine watching as the crust gives way and falls for one or two miles into the void. Imagine watching as the dust slowly clears away to a new and vastly changed landscape that will be void of life for years. Imagine as the volcanic activity in the caldera declines and ends, and over millions of years, the rocks are exposed by uplift, mountain-building, and erosion. What an incredible place! Thank you dear brother and sis-in-law for the great trip! For those of my readers in the Modesto vicinity, I would like to let you know of an interesting cinema series taking place over the next few months at the State Theatre. Science on Screen is an effort to increase science literacy in our region using popular movies and presentations by experts in some different scientific disciplines. The first movie in the series, on Sunday, January 27th, is Contact, based on the book by Carl Sagan regarding our first contact with extraterrestrial beings. 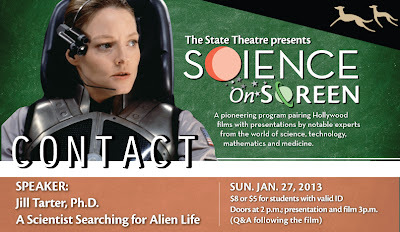 Jodie Foster stars as a SETI researcher who finds radio signals from outside our Solar System, and the movie follows events that follow that discovery. Our speaker will be Jill Tartar, PhD, on whom the Jodie Foster character is partly based. Dr. Tartar served as the director for SETI for a number of years. The event begins at 3 PM with the presentation, and a question and answer period will follow the movie. The event itself will be interesting and fun, but if you have never seen a movie at the State Theatre, you are in for a special treat. The State dates back to the 1930s, and was recently renovated to provide an experience of watching a theatre movie when it was an event. The State Theatre is located at 1307 J Street in downtown Modesto. The movie series is made possible by a grant from the Alfred P. Sloan Foundation. Three more movies will make up the remainder of the film series: Robot and Frank, Day After Tomorrow, and Jurassic Park. 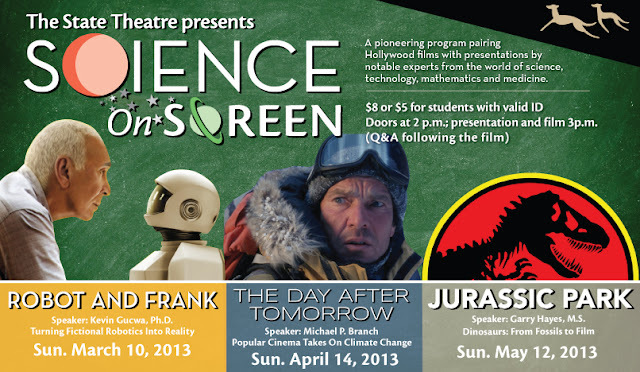 Geotripper himself will be speaking at the dinosaur movie, presumably about dinosaurs...and movies. Hope to see you at all the programs! How many puns can a man take (or tell)? Today we were on the road again, and true to my resolution, I went someplace new. We were traveling into Arizona, and I knew that there was a stretch of the original Route 66 that passed through the small gold mining town of Oatman. I didn't read up on the site ahead of time, so the presence of their famous 'wild' burros was a bit of surprise. The town is a tourist destination these days, with daily old west gunfights, the Clark Gable/Carole Lombard honeymoon suite at the Oatman Hotel (and a ghost), and lots of curio shops, but the town has an interesting geologic history as well. The burros are the feral descendants of burros who escaped from or were abandoned by the early miners. There is a jackass in this picture. 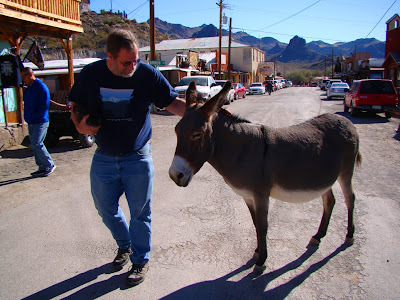 Oh, and also a burro on the right. 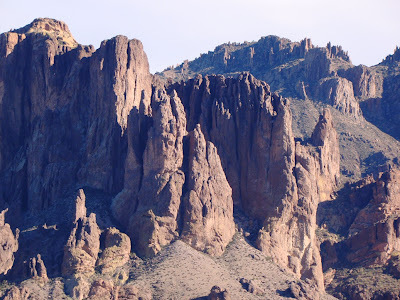 The rocks here at the southern end of the Black Mountains of Arizona are late Cenozoic volcanic tuffs and lava flows which have been eroded into scenic pinnacles and spires. 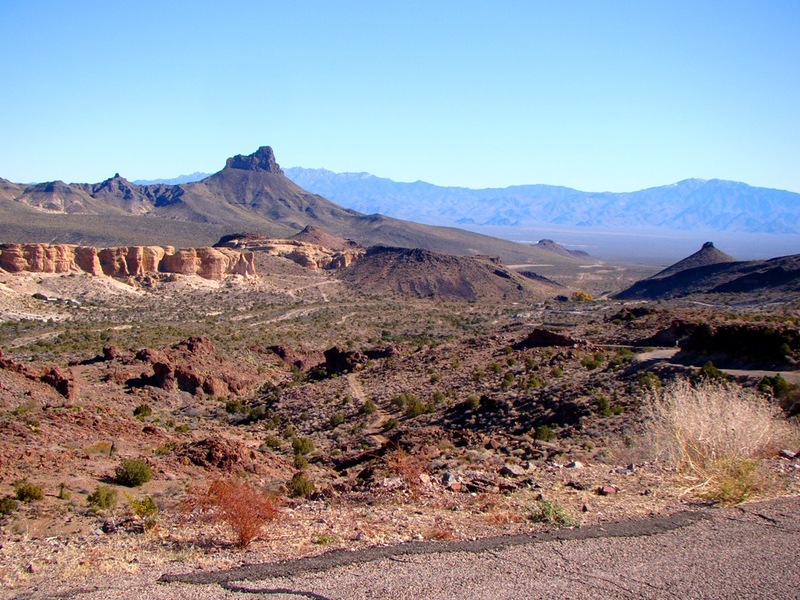 The source of the very extensive Peach Springs Tuff was a caldera in the immediate vicinity of Oatman. 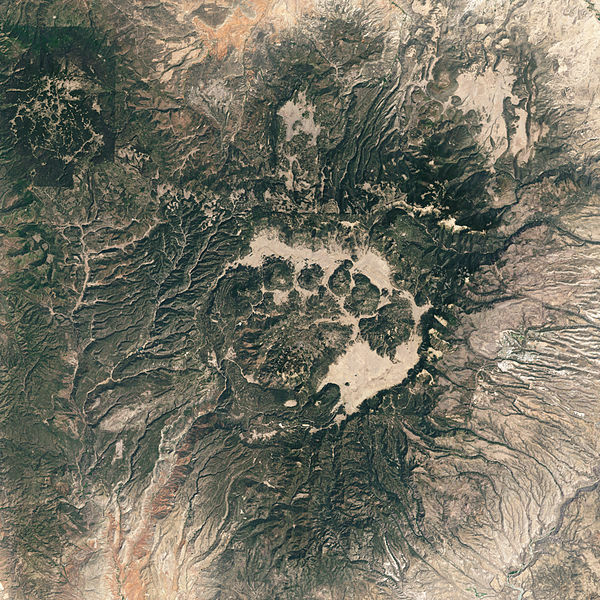 The eruption took place 18-19 million years ago, and covered a region extending from Barstow, California to Peach Springs in Arizona. Tens of cubic miles of volcanic ash were blasted into the atmosphere during the catastrophic eruption. Gold and silver have been mined in the region since 1863, with the main production at Oatman between 1915 and 1942. Gold production in the region amounted to about 2.2 million ounces. The Gold Road Mine above town looked to be active when we passed by. 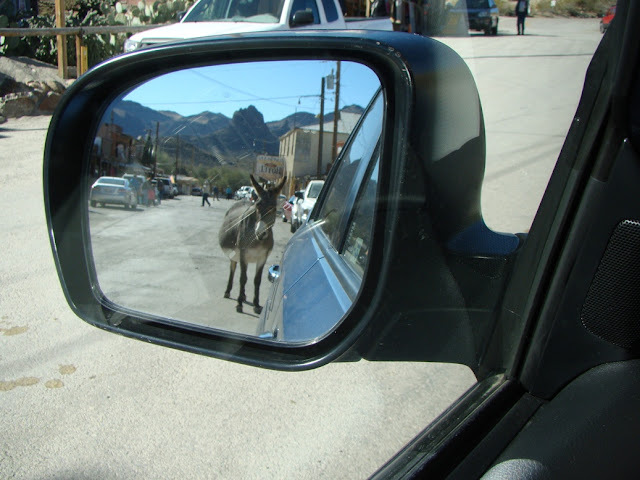 Oatman had a slightly more sinister reputation, at least to the thousands of Dust Bowl refugees who passed this way in the 1930s. The town is located in some rugged mountainous terrain, and Route 66 originally passed through town. The road is steep and winding, and must have been nerve-wracking to the folks driving ancient cars with brakes and transmissions of dubious quality. Beyond Oatman lay the Colorado River and the vast Mojave Desert of California. Although it is easily traversed today on modern freeways, in the 1930s a summertime passage could be terrifying and dangerous. My grandparents made the journey in the early 1940s, driving at night to avoid the worst of the heat. The town was bypassed in 1953 when a less rugged stretch of highway connected Kingman with the town of Needles in California on the Colorado River.